More than almost any other genre in the medium, kart racers are built to put fun above all else. The same can be said when considering Nickelodeon's place in the children's programming landscape. Fun is the name of the game, therefore a game that combines these two elements should naturally provide a frictionless path to entertainment for players, yet somehow that's mostly untrue. Nickelodeon: Kart Racers manages to take a great premise and squanders it with a game that is hard to recommend to any of its intended audiences, be they families, kids, or nostalgic gamers. 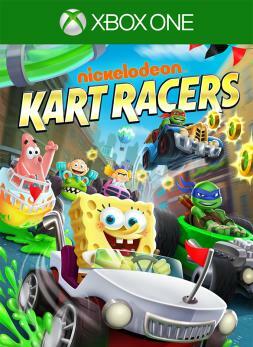 Nickelodeon Kart Racers offers a range of racing options not unlike many other games in the genre. Across single races, four-race Grand Prix events, arcade battle modes, and local multiplayer, players take the driver's seat as different Nicktoon icons. Immediately, one of the game's most glaring issues can be spotted in the menus before you even hit the track. A measly 12 cartoon characters round out the entire roster and right away, you'll be disheartened by the game's egregious lack of characters. What's worse, among these 12, four of them are the Ninja Turtles, a license that only recently rests under the Nick umbrella, so for anyone coming into the game over the age of 18 with nostalgia or a love for the genre, the Ninja Turtles will feel foreign in the slimed-out world of Nicktoons. Along with the four Ninja Turtles, there are two from Hey Arnold!, three from SpongeBob SquarePants, and three from Rugrats — ineptly, one of them is Reptar and not Chuckie Finster. No CatDog, no Rocko's Modern Life, no Wild Thornberries. It's bare bones and it's a huge letdown. Such a poor showing of Nickelodeon's illustrious history does well to represent how the rest of the game also seems to hardly use the license with which it's working. 24 tracks in total is a good number, but each of them are quite ugly due to the game's last-gen visuals. You'll often drive past things that look vaguely familiar, like Arnold's school or a toy store not unlike something the Rugrats may have visited, but other than the slime that is spilled across different track sections, there's not much present that makes anything feel decidedly Nick-like aesthetically. It doesn't help that the audio seems to never borrow from the properties either and instead sounds like each musical track comes from a royalty-free library. It's as though the Nickelodeon license was tacked on late in development. Ultimately that seems unlikely, but if it was found out this is what happened, everything would make much more sense. When characters hit each other with power-ups or perform other maneuvers, it's an on-screen text bubble, not voice acting, that reacts. It's all so lifeless, so drained of anything resembling fun, that it becomes almost impossible to enjoy no matter how old you are. I say "almost," because the basics of the racing are at least competent enough and borrow so closely from better kart racers that the game remains playable for families who just really want a new game like this with these characters, even if there are so few to choose from. Everything from the power-up options, to the way the game's speed boost system behaves, to the way tracks slightly change on the last lap, is all so familiar. That ultimately works in the game's favor just enough to keep it enjoyable for those with low expectations and a desire to play locally with loved ones. Hardly a glowing endorsement, it at least keeps the game's head above water. Still, there are just too many other better options in the genre, even if you don't have a Nintendo console. The achievement list is a fairly easy one, although you'll maybe bump into some issues when chasing the difficulty-related achievements because even on easy the game's AI can get pretty annoying. They have a habit of hitting you with a power-up right at the finish line, and that trend only worsens on higher difficulty modes. Outside of those, the rest of the list won't slow you down, although you'll need to get to level 10 and unlock every upgrade in the shop, which will take a few hours. The reviewer spent five hours racing around the tracks with his family and barely managed to have some fun. He gathered 15 of 27 achievements for 400 gamerscore. An Xbox One review code was provided by the publisher.